“Speak with your wallet” is something often said about consumerism. If you think about it, you send a message with every purchasing decision. One decision is to support a cause or organization. For many in the vegan community, contributing to animal shelters and farm sanctuaries makes an impact on multiple levels. You’re giving animals a chance at full lives. You’re reducing suffering. You’re making connections to other species. “Animals are our friends” has been the moral of many instructive fables and childhood stories. The main characters, non-human animals, were endearing, and they’d become my friend, your friend, everyone’s friend. I couldn’t imagine anyone ever eating or harming them, because they were good animals who cared for others, did good deeds and taught valuable lessons. If they were in trouble, I would be sad, and vow to help them in any way I could. Adopting veganism in my early 30s helped me to see that I had been contributing to the suffering of animals. Certainly, it wasn’t on purpose. It was that cognitive dissonance that didn’t make the connection between my non-human friends and WHO would be on my plate. Needless to say, I learned a new lesson: “Animals are our friends, not our food.” I vowed to help in any way I could. Animal sponsorship programs, like Farm Sanctuary’s Adopt a Farm Animal Project, do just that. They tell real stories of individuals who are seen AND heard. These animals can touch your heart, make you laugh and cry and teach you something more than any storybook could. It doesn’t matter how near or far from you the animal you’re helping lives, you’ve given a gift to a special creature and her caretakers to make sure she and her loved ones have robust lives as intended. This is why my husband and I sponsor animals as part of our donations to local shelters and sanctuaries. 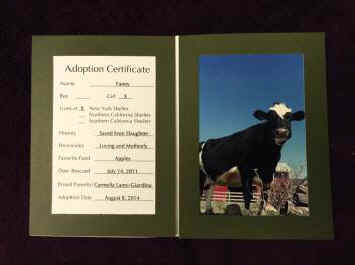 This year, after attending our second NY Country Hoe Down at Farm Sanctuary in Watkins Glen, NY, we “adopted” Fanny, a beautiful cow we’ve met on both visits! 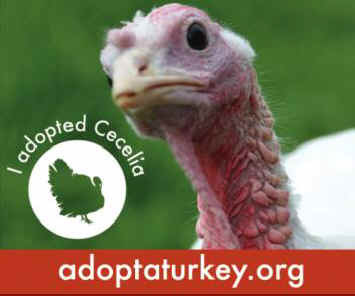 This is also the fourth year, we’ve adopted a turkey from Farm Sanctuary’s Adopt A Turkey Project: Cecilia, one of twenty-four babies Farm Sanctuary recently saved from factory farming. In helping these few individuals, we show our love and compassion for all. By sharing stories of Fanny, Cecilia, and others, we can hope to have an effect on others who want to make a change, big or small, for all animals, including us humans. “Speak with your wallet” is something often said about consumerism. If you think about it, you send a message with every purchasing decision. One decision is to support a cause or organization. For many in the vegan community, contributing to animal shelters and farm sanctuaries makes an impact on multiple levels. You’re giving animals a chance at full lives. You’re reducing suffering. You’re making connections to other species. You’re using your voice to tell government industry to make a change. What better way could there be than to put a name to a face to share with the world? Think about how you can make the world better for animals. Maybe farmed animal sponsorship or adoption is a way for you to do it. Whatever you do to help them, share it with the world. Carmella Lanni-Giardina, VLCE is an e-commerce specialist and marketer, who just happens to be VEGAN! She’s a savvy social media enthusiast, blogger and co-host of the weekly #VeganFoodChat and #Luv4Social Twitter chats, and uses her voice to spread the messages of compassionate living and community building. Carmella lives in NYC with her husband Carlo (soon to attend Main Street Vegan Academy and earn his VLCE certification) and two cats, Connie and Mozzer. Want to learn more about Carmella? Her About.me page is quite telling!